Quantum annealing (QA) is a general method for finding the global minimum of a given objective function over a given set of candidate solutions (candidate states), by a process using quantum fluctuations. It is used mainly for problems where the search space is discrete (combinatorial optimization problems) with many local minima; such as finding the ground state of a spin glass employing quantum tunneling (across the barriers separating the global minimum from the local minima or spin configurations). Quantum annealing starts from a quantum-mechanical superposition of all possible states (candidate states) with equal weights. Then the system evolves following the time-dependent Schrödinger equation, a natural quantum-mechanical evolution of physical systems. The amplitudes of all candidate states keep changing, realizing a quantum parallelism, according to the time-dependent strength of the transverse field, which causes quantum tunneling between states. If the rate of change of the transverse-field is slow enough, the system stays close to the ground state of the instantaneous Hamiltonian, i.e., adiabatic quantum computation. The transverse field is finally switched off, and the system is expected to have reached the ground state of the classical Ising model that corresponds to the solution to the original optimization problem. An experimental demonstration of the success of quantum annealing for random magnets was reported immediately after the initial theoretical proposal. 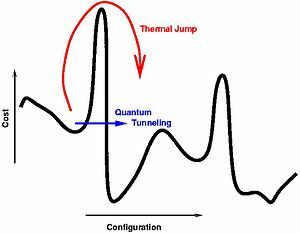 Quantum annealing can be compared to simulated annealing, whose “temperature” parameter plays a similar role to QA’s tunneling field strength. In simulated annealing, the temperature determines the probability of moving to a state of higher “energy” from a single current state. In quantum annealing, the strength of transverse field determines the quantum-mechanical probability to change the amplitudes of all states in parallel. Analytical  and numerical  evidence suggests that quantum annealing outperforms simulated annealing under certain conditions. The tunneling field is basically a kinetic energy term that does not commute with the classical potential energy part of the original glass. The whole process can be simulated in a computer using quantum Monte Carlo (or other stochastic technique), and thus obtain a heuristic algorithm for finding the ground state of the classical glass. In the case of annealing a purely mathematical objective function, one may consider the variables in the problem to be classical degrees of freedom, and the cost functions to be the potential energy function (classical Hamiltonian). Then a suitable term consisting of non-commuting variable(s) (i.e. variables that have non-zero commutator with the variables of the original mathematical problem) has to be introduced artificially in the Hamiltonian to play the role of the tunneling field (kinetic part). Then one may carry out the simulation with the quantum Hamiltonian thus constructed (the original function + non-commuting part) just as described above. Here, there is a choice in selecting the non-commuting term and the efficiency of annealing may depend on that. It has been demonstrated experimentally as well as theoretically, that quantum annealing can indeed outperform thermal annealing (simulated annealing) in certain cases, especially where the potential energy (cost) landscape consists of very high but thin barriers surrounding shallow local minima. Since thermal transition probabilities (~ ; => Temperature, => Boltzmann constant) depend only on the height of the barriers, for very high barriers, it is extremely difficult for thermal fluctuations to get the system out from such local minima. However, as argued earlier in 1989 by Ray et al. in Ref. , the quantum tunneling probability through the same barrier depends not only on the height of the barrier, but also on its width and is approximately given by , where is the tunneling field. If the barriers are thin enough , quantum fluctuations can surely bring the system out of the shallow local minima. For -spin glasses, ~ , and with a linear annealing schedule for the transverse field, one gets ~ for the annealing time (instead of ~ for thermal annealing). This advantage in quantum search (compared to the classical effort growing linearly with or , the problem size) is well established. It is speculated that in a quantum computer, such simulations ould be much more efficient and exact than that done in a classical computer, because it can perform the tunneling directly, rather than needing to add it by hand. Moreover, it may be able to do this without the tight error controls needed to harness the quantum entanglement used in more traditional quantum algorithms. Photograph of a chip constructed by D-Wave Systems Inc., mounted and wire-bonded in a sample holder. The D-Wave One’s processor is designed to use 128 superconducting logic elements that exhibit controllable and tunable coupling to perform operations. In 2011, D-Wave Systems announced the first commercial quantum annealer on the market by the name D-Wave One and published a paper in Nature on its performance. The company claims this system uses a 128 qubit processor chipset. On May 25, 2011 D-Wave announced that Lockheed Martin Corporation entered into an agreement to purchase a D-Wave One system. On October 28, 2011 USC’s Information Sciences Institute took delivery of Lockheed’s D-Wave One, where it has become the first operational commercial “quantum computer”. 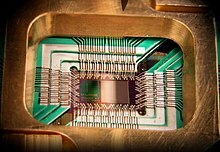 In May 2013 it was announced that a consortium of Google, NASA AMES and the non-profit Universities Space Research Association purchased an adiabatic quantum computer from D-Wave Systems with 512 qubits. An extensive study of its performance as quantum annealer, compared to some classical annealing algorithms, is already available. In June 2014, D-Wave announced a new quantum applications ecosystem with computational finance firm 1QB Information Technologies (1QBit) and cancer research group DNA-SEQ to focus on solving real-world problems with quantum hardware. As the first company dedicated to producing software applications for commercially available quantum computers, 1QBit’s research and development arm has focused on D-Wave’s quantum annealing processors and has successfully demonstrated that these processors are suitable for solving real-world applications. D-Wave’s architecture differs from traditional quantum computers (none of which exist in practice as of today) in that it has noisy, high error-rate qubits. It is unable to simulate a universal quantum computer and, in particular, cannot execute Shor’s algorithm. Great info. Lucky me ӏ discovered yoսr website Ьy accident (stumbleupon). Ι’ve saved it fօr lateг!